AZ1.27 a new ministry opportunity for all of Grace Community Church! I often say whether in a sermon or a prayer, “let us be the hands and feet of Jesus here in Flagstaff”! I love that. I know many of you are loving and serving Christ throughout your place of work, your classes and your neighborhoods. Here is another opportunity for us to do something together. Arizona 1.27 is a state-wide movement of churches working together to see every child in foster care placed in a loving home. Grace Community is partnering with AZ1.27 to learn all the ways we can help kids and families. On Monday night, April 29 we will be hosting an AZ1.27 Orientation. This orientation will help those that have interest and questions about fostering and/or adoptions here in Arizona. But, just as important are all the ways the rest of us can lend a hand. Together we’ll learn ways the local church can help kids and families. I can’t wait for you to join me on April 29. Go here to register. Registration is not mandatory, but it really does help! Thanks. Martha loved Jesus. My guess is, it didn’t take long for Martha to know that Jesus loved her too. Her way of showing love was through serving. Biscuits. Maybe a pie. She loved to serve and if something needed to be done she saw no reason not to get after it and get to work. What I love about the passage in Luke 10:38-42 that we studied last Sunday, is that Luke gives us a glimpse of something so very ordinary. This wasn’t a huge scene. There would be no need for background music. Not much of a build up. Just a regular day, doing regular stuff. Jesus stopped by. How cool is that, by the way! Kind of reminds me that Jesus is always with us as well. We don’t go looking for Him. He found us. We’re His now. By His choice and design, He lives within us! I just love, “Christ in you”. So, it’s a regular day. Jesus stops in and Martha is going to make sure no one starves. Mary sits in the living room with Jesus and maybe the others, assuming Jesus was traveling with the 12 at this point. Do you ever just “get to work” on something, maybe even something for Jesus without ever stopping to ask Him? Just sit with Him and listen first. What we hear as Jesus calls out her name, is Him calling out our name too. A loving, gentle, but clear redirection. “Come, spend some time with Me.” Listen. Perhaps you too can testify that on most days, spending a little time with Jesus and His Word helps me throughout the day. Hear His word. Make application from what you’re hearing, then go live the ordinary day. Biscuits. Pie. It’s all good. We just enjoyed 3 great Christmas Eve services, where we were able to welcome many guests and share with a few hundred the wonder of coming Home for Christmas. I am so thankful for the many people of Grace Community that worked and gave extra to help us have amazing Christmas services. Behold, a virgin shall bring forth a son, and they shall call His name Emanuel, which being interpreted is, God with us. Isaiah 7:14 (R.V.). His Birth in History. “Therefore also that holy thing which shall be born of thee shall be called the Son of God” (Luke 1:35). Jesus Christ was born into this world, not from it. He did not evolve out of history; He came into history from the outside. Jesus Christ is not the best human being, He is a Being Who cannot be accounted for by the human race at all. He is not man becoming God, but God Incarnate, God coming into human flesh, coming into it from outside. His life is the Highest and the Holiest, entering in at the lowliest door. Our Lord’s birth was an advent. His Birth in Me. “Of whom I travail in birth again until Christ be formed in you” (Gal. 4:19). Just as Our Lord came into human history from outside, so He must come into me from outside. Have I allowed my personal human life to become a ‘Bethlehem’ for the Son of God? I cannot enter into the realm of the Kingdom of God unless I am born from above by a birth totally unlike natural birth. “Ye must be born again.” This is not a command, it is a foundation fact. The characteristic of the new birth is that I yield myself so completely to God that Christ is formed in me. Immediately Christ is formed in me, His nature begins to work through me. God manifest in the flesh—that is what is made profoundly possible for you and me by the Redemption. Here’s a Christmas gift they’ll never forget! Still need to find the right gift for that very special person? You’re not too late! I’ve never liked the ads that came out in early December shaming me with words like “last minute” or “hurry, final days”, like they know anything about procrastination. I’m a pro at it. When it comes to shopping, I bet I can find it on the way home! Well, that’s a little tongue in cheek, but you get the idea. I hope you’re doing well with it all, but if you need a little idea, let me help. 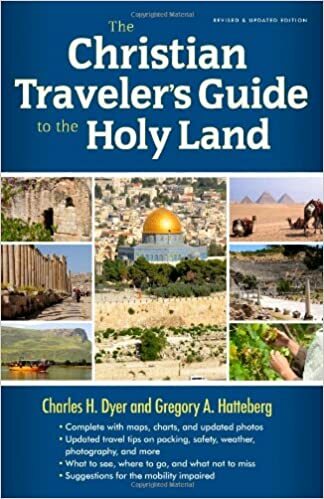 How about a trip to Israel next October? How’s that for “best Christmas present ever”? Whether you want to give the best ever, or it’s time for you to make a trip like this happen, here’s some just-released information! Check here for the website with all of the details! First 20 to sign up with a deposit receive a free book! Don’t forget to check out the website for all the details! As I’m writing this, it’s still Yom Kippur. The day of atonement. Praise God we can know Him because of what Jesus did for us on the cross. 9 We know that Christ, being raised from the dead, will never die again; death no longer has dominion over him. 10 For the death he died he died to sin, once for all, but the life he lives he lives to God. 11 So you also must consider yourselves dead to sin and alive to God in Christ Jesus. That’s it. That’s the best news ever. On a side note, next year’s Yom Kippur will be in October. I looked it up. Because… ready? We’ll be IN ISRAEL next year! This past week I secured our spot for a group trip to Israel, Oct 3 -12ish. Because we’re over a year out, we can’t secure all the details just yet, flights, schedules, etc. But, the good news is, you can NOW pencil in those dates and start saving! More details will come as we get closer, but please feel free to pass this on and make sure you save your spot! Can’t wait! My older sister gave me my first Thompson Chain Reference Bible in 1979, or early 80s. I literally wore it out. Then the youth group I was serving gave me my second Thompson Chain in 1988. I saw those Bibles as what I would call “glorified concordances”. There is this amazing system (chains) of references and topics. I did not wear out the second one, I simply moved on to other study Bibles. Just a few weeks ago I attended a workshop put on by my good friend, Chuck Ballard on how to use the Thompson Bible. Chuck was the first pastor to welcome me to Flagstaff 25 years ago next month. We’ve remained good friends ever since. He has since moved on and is now leading a ministry called African Pastoral Training Ministries in which he trains African pastors how to study and prepare sermons using only the Thompson Chain Bible. This is an amazing ministry because most of these pastors will have no other resources. Through the conference they receive a new Bible and three days of training. I was amazed both by the use of the Thompson Bible and specifically how Chuck teaches the students to study the Bible using ONLY the Bible! Dr. Frank Charles Thompson did the world a great service in 1908 when he put together this massive system of studying scripture with scripture using over 4200 chain topics and 100,000 topical references. It’s actually pretty simple to use once you understand the system. Chuck did a great job leading this four-hour workshop. I plan to invite him to our church to do the same in the near future. The Bibles are available most anywhere. You may want to check out the dedicated website for Kirkbride or do what I did and find your favorite version on Amazon. Though I have no plans to abandon my Logos Bible software or get rid of any of my favorite study Bibles, I am enjoying getting familiar again with my new ESV Thompson Chain. I highly recommend Chuck and his ministry. Thank you, to the ones who welcome and direct in the parking lots. Thank you, to the many who volunteer each week to set it all up. You transform a public school into a sacred place. Thank you, to the greeters at the doors, who smile and let me know I’m in the right place. Thank you, to the ones who are ready to serve by getting the kids checked in and ready to go to their classes. Thank you, to the many who volunteer weekly to teach the kids, care for them and keep them safe all while honoring Jesus. Thanks you, to the ones who give of themselves to our youth. Weekly meetings and coffee shops, bleachers and floors. Thank you, to the ones committed to good coffee. Nothing average about you or your product. Thank you, to those who prepare and serve us all in ways we may never see. Thank you, to those who open their homes to welcome the body in bite size pieces. Thank you, to those that prepare, study and deliver a word to encourage and teach and point us to the Word and the Author. Thank you, to the many smiles along the way. I know I belong here. Some like handshakes. A few like the hugs. But we all love the smile. Thank you, to the ones who gather early, every week, to pray. To go before God on our behalf seeking His favor, His blessing, His pleasure. Not for the temporal, but for the eternal. Thank you, to the technicians, who work so no one will notice them, but that all may encounter Christ. Thank you, to the gifted musicians who labor so we can engage as a congregation with hearts and voices towards our eternal God! Thank you, to the leaders who lead. To the servants who serve. To the artists who create. To the kids who run and the teens who huddle. To the ones that hurry. To the ones that keep it steady. To the many who offer their craft, their labor, to all who give with love. Thank you, Grace Church for being exactly who you are. Enter his gates with thanksgiving and his courts with praise! Give thanks to him; bless his name! For the Lord is good; his steadfast love endures forever, and his faithfulness to all generations. This is the week we were scheduled to be in Israel. Back in August at a deadline, we found ourselves just a little shy of the necessary number to form a group. Laurie and I totally trust God with such details, but we were and still are a little disappointed. Another time. Soon, I hope. I would love to return and take a group from Grace and other friends. I’m loving our two services that we started on October 1. I’ll look up some stats and give a report, but overall I think it’s been a very healthy move for us. I love watching people serve and engage with each other so well. I’ve absolutely loved meeting guests each week! For months I’ve not written on the blog mainly because I was using the “Come to Israel” post as a reference for people to learn about our trip. This past week we came to the deadline for sign-ups and found ourselves short of the original goal. I was obviously disappointed to have to cancel the trip and to tell the group that had committed that we’d have to wait until next time. Jennifer and the entire team at Maranatha Tours has been a great group to work with and have even provided another tour for those from our group that still want to go. As I told the group in my letter, I really do trust God’s leading in these areas. Of course I wanted to go, as did they. However, I knew going into it that it was a pretty significant trip. I’m a little bummed but I also know that it’s all good. When Laurie and I went 2 years ago, I knew I’d love to return, but I also knew that if that was the only time I’d go, I was so thankful. Perhaps someday we’ll return. I’m so excited to post that we have finalized our plans to host a group to Israel this coming November 2-11. In March of 2015 Laurie and I were gifted our first trip to Israel. It had a profound impact on both of us as we joined a group and walked the steps and saw the sights that the Scriptures have long told us about. I knew soon after I arrived that I would want to return and make the opportunity available to my friends and family. Take a look at the link below, and begin now to prayerfully consider taking this trip of a lifetime along with us. Our first “Israel 2017 Informational Meeting” will be Sunday, January 29th at 11:30 a.m. in the mini-auditorium at Sinagua. This is immediately after our morning worship service. The meeting should be 30 minutes. We’ll be discussing the details and answering questions. You can pick up a brochure at the church office or at the Information Table at church on Sunday. If you’d like one mailed to you, simply let us know.